Good morning, readers! I hope all of my US readers had a great holiday weekend! 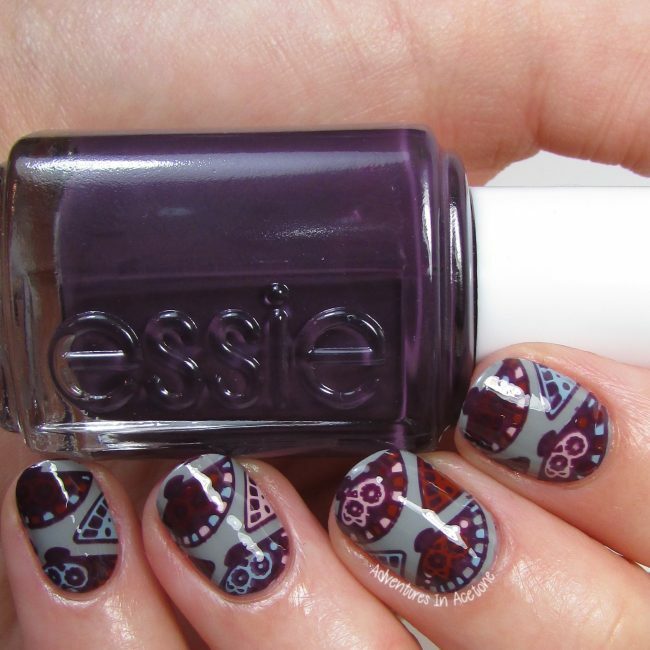 Today, I have a fun stamping decal mani to share with you that I created using the Essie Fall For Japanese Collection! I have swatches of the collection to share this week, so keep an eye out for those! 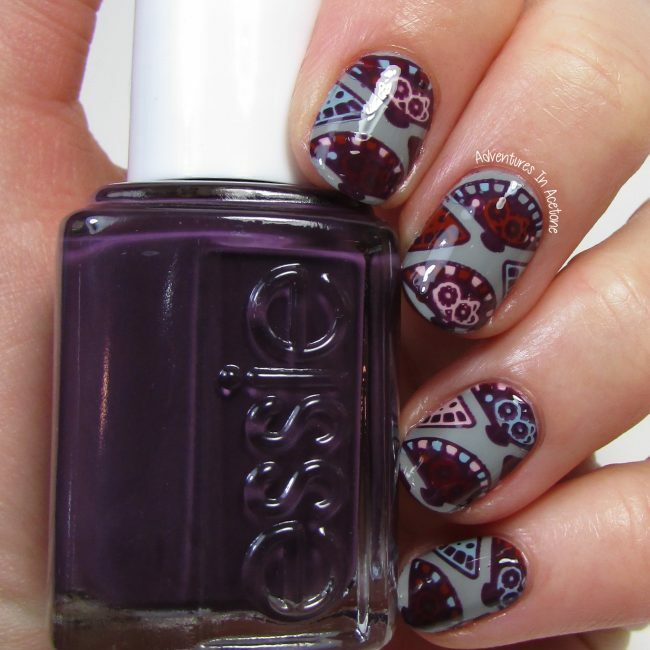 For this look, I used my ÜberChic ÜberMat to create stamping decals and filled in the fan design with the collection colors. Let’s take a look. I began with two coats of Essie Now and Zen on my nails and let those dry. Once they were drying, I made my decals. I first painted a clear coat onto the fingernail sections of my ÜberMat and let dry. 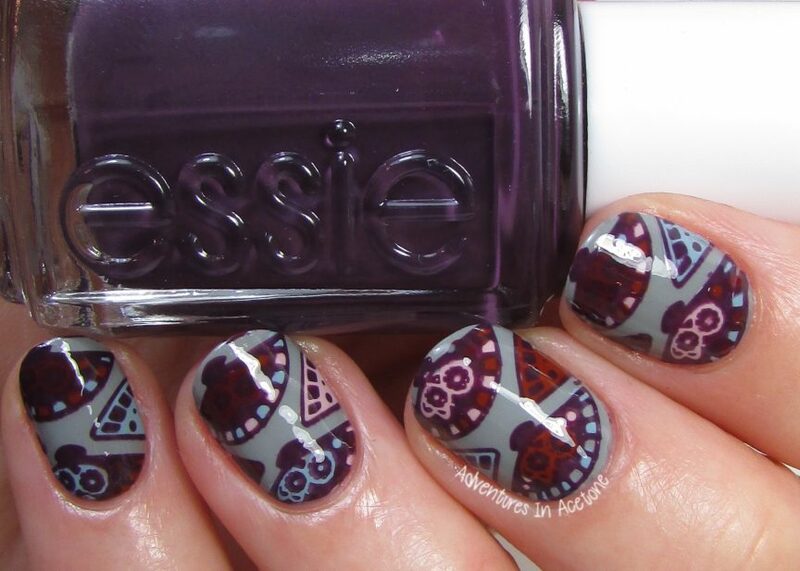 Then, I stamped the fan design from Cheeky CH37 onto the clear with Essie Kimono-Over. This dark purple was opaque enough for stamping and I was excited about that! I used a small dotting tool and the rest of the Essie Fall For Japanese Collection to fill in the fan designs: Go Go Geisha, Maki Me Happy, Playing Koi, and Udon Know Me. Once the decals were dry, I peeled them up carefully from the mat, flipped them over to see the completed design, and applied them to my nails. The nails got a coat of top coat and I pressed the decals onto them while the top coat was still tacky. After removing the excess decal from the sides and tips of the nails, I painted a coat of KBShimmer Clearly on Top to seal in the decals and add shine. What do you think of this look? I’m really happy with how these turned out and cannot wait to show you the full swatch post of this collection.